Love the outdoors? Like to work with your hands? Are trainable and need little supervision? 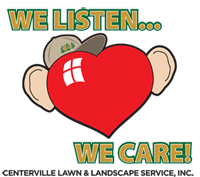 You will love Centerville Lawn & Landscape Service, Inc. We have highly trained experienced positions available as well as entry level positions. Contact us….we may have the career you will thrive in. Or complete and submit the form.